It’s sunny. I mean really sunny. In case you haven’t noticed I’ve a bit of an obsession with the weather! It’s amazing how really good weather affects your mood. The house is looking brighter and it’s so much easier to get through the day when the sun shines. I was walking home with the boys the other day and whatever way the tides were (I can’t see the beach from the house), I could smell the sea and I was transported back to my childhood summers. Growing up we lived near the sea but not as near as I do now. It was about a 20 min stroll to get the coast and while that was lovely it was the walk back up the hill home was a killer! Every summer for a week or two my Mam would pack up the car, Dad would pack his bag at the last minute, and we would drive to Clogherhead in Louth. It’s not that far away from where I grew up as the crow flies but it was our holiday. I wish I could tell you about fabulous summers that I spent lolling in the sun, playing on the beach and making friends. I can’t because I used to spend the whole 2 weeks spent with my nose in a book! It’s only now as an adult that I can appreciate what a wonderful holiday home we had use of thanks to Ma, my Grandmother. Because the holiday home had been in the family for years and years there were many friends for both children and adults up there. I remember one family, coincidentally from the same hometown as us, where the mother had 2 specialities. The first being porter cake, and the second homemade lemon cordial. She must have made gallons of the stuff every summer and we used to beg to be allowed drink it. Once I asked Mam would she make it and I remember her tut tutting and saying that it contained buckets of sugar, it wasn’t good to be drinking all the time and that it took ages to prepare. Now as a mother myself I understand the need to make things in a hurry if you’ve a bunch of kids running around and so I’ve got a quick recipe which doesn’t need to be cooked on the hob, has minimal fuss and tastes delicious. 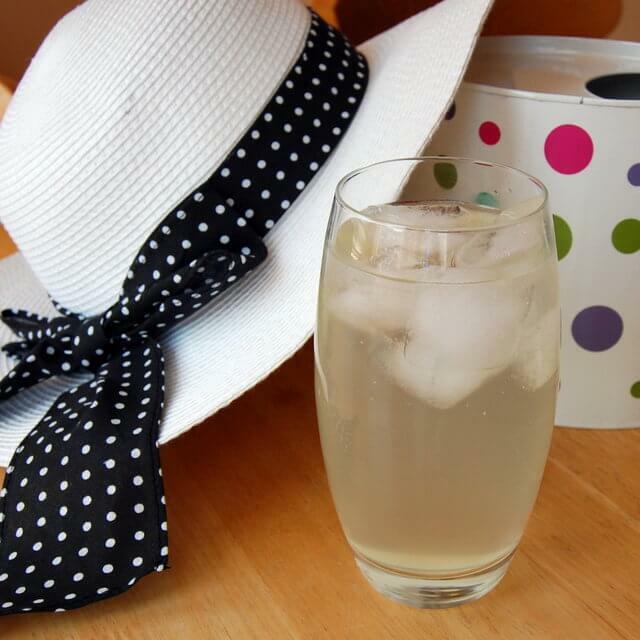 I’m not a fan of sweet drinks and this quick lemonade recipe is quite tart but feel free to add more sugar at the early stages if you prefer. The cordial works well on it’s own with plenty of ice and water but it is also delicious with vodka and ice instead. It’s best if you make this with unwaxed lemons but they can be expensive to buy so watch out for them on special. large spoon or fork for stirring. Using the vegetable peeler carefully peel the top layer of the lemon skin away. Try not to get any of the white pith from the lemon skin. Peel all 5 of your lemons this way. You can use a zester if you prefer, I just didn’t have one to hand and this can be quicker. Cut the lemons in half and juice them all. Into the heat resistant jug measure the sugar and boiling water. Stir until the sugar is dissolved. Add the lemon juice and lemon peel to the hot mixture. Stir again. Pour the cold water into the mixture and stir for the last time. Cover the jug with clingfilm and set to one side to cool. This allows the flavour to develop. It takes about 4 hours to cool but if you can leave it overnight the flavour is much better. Once cool, strain the mixture through a sieve or muslin cloth and dilute to taste. For a flavour twist why not add 2 black peppercorns at stage 4 above? Oh do try it A. I’ve had a couple of people try it in the past few days and the verdict has been very positive! I love lemon & peppercorn, it’s a very adult flavour along with vodka! I’m going to make this later for the kids lunch boxes! Oh do, that’ll be a lovely treat! Bravo pour ce joli blog ! ça fait longtemps (depuis mon voyage en Irlande) que j’avais envie de faire une limonade maison ! Vous avais gouté la limonade á Glenilen Farm en Bloom?